2009 Donkey Dingač Postup from Vinarija Dingač in Pelješac Peninsula, Croatia. This little donkey is a juicy spicy kick of dark fruits with bright acidity and firm tannins. There are two protected wine growing regions in southern Dalmatia– Postup and Dingač. And it can get a little confusing with regard to the varietal names. 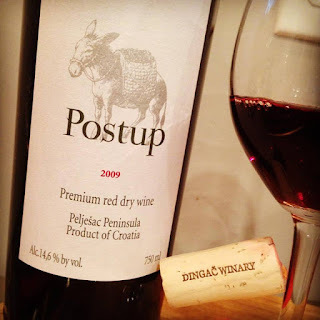 While this wine is made of 100% Plavac Mali grapes the wine is called Postup, after the wine-growing region on the Pelješac Peninsula. Also confusing is that Dingač is the name of both the region and the winery, a former communist co-op from the time when the area was still known as Yugoslavia. The donkey on the label is not only cute, but symbolic of the rugged lands and steep slopes in which the vines grow, making hand harvesting a necessity. But despite all the confusing names one thing is perfectly clear — the wine is delicious. It’s spicy and concentrated with a meatiness and hint of sage. Surprisingly it doesn’t drink like it’s 14.6 AVB! It’s bright indeed, but not hot. I love it and can’t wait to visit the winery when I tag along with the Blue Danube Wine team later this month.